Richard E. Wyman of Keene, New Hampshire, joined General S.G. Griffin, Camp 10, Sons of Union Veterans of the Civil War on April 15, 1938 at the Department Encampment in Concord, New Hampshire. His eligibility comes from his maternal Grandfather, Luther M. Parker, who served in Company C. of the 14th New Hampshire Volunteers. Within his Camp, he served in all offices including Camp Commander in 1942 and Secretary-Treasurer 1951 - 1981. On the Department level, he held all offices except Treasurer and served as Department Commander on three occasions, 1956, 1974 and 1975. 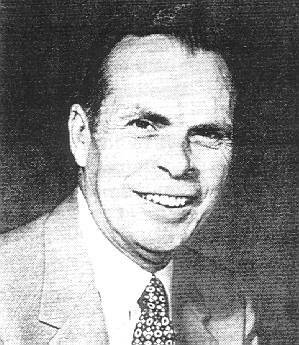 Brother Wyman was elected to the office of Commander of the New England Regional Association in 1958. He served as General Chairman when the New England Regional Association celebrated its 40th anniversary in 1975. On the National level, he served as National Chaplain twice, Chairman of the Americanism and Education Committee, Junior Vice Commander-in-Chief and Senior Vice Commander-in-Chief. He was elected Commander-in-Chief at the 99th Annual National Encampment held in Richmond, Virginia on August 10 - 14, 1980. Brother Wyman served in the United States Army from 1942 to 1946; being stationed in New Guinea, Philippines Islands and Japan. He was a surgical technician in the 35th General Hospital and the 168th Evacuation Hospital. He was discharged as a Staff Sergeant. Brother Wyman was a teacher. In 1980, he finished 31 years of teaching in schools in Wooster, Ohio, and Spofford, Grantham, Harrisville, West Swanzey and Keene, New Hampshire. He taught grades one through eight. In addition to teaching, he served as the first President of the Teachers' Association of the old Union No. 38 and President of the Monadnock Regional Teachers' Association. He was a member of the Keene Education Association, New Hampshire Education Association, and a life member of the National Education Association. Additional affiliations and activities included Brother Wyman's service as Secretary of the Keene Community and School Safety Committee in Administrative Unit 29, Assistant Director of Camp Union in Greenfield, New Hampshire and Secretary for the Parker Reunion Association, his mother's family group. He also worked as a nurse's aide at Pheasant Wood Nursing Home in Peterboro, New Hampshire. Brother Wyman passed away on November 18,1981.